Over the next year, at least half a dozen other Texas cities are likely to tackle the same thorny debate that's under way in Austin over how to regulate vehicle-for-hire apps like Uber and Lyft while maintaining traditional taxi services. 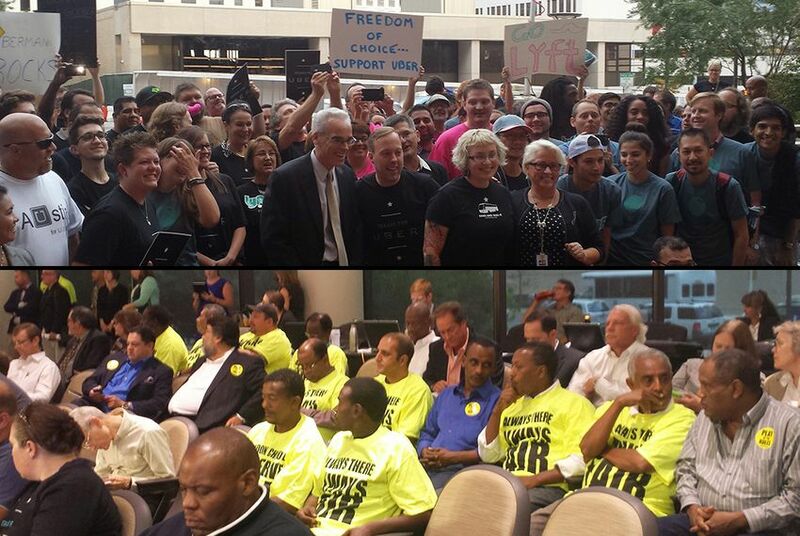 The battle lines were clearly drawn at a tense City Council meeting one evening last week in Austin. In yellow T-shirts were supporters of traditional cab companies. The slogans on their shirts — “Always There, Always Fair,” “Play by the rules” — were clearly visible to the council members. A larger group of about 50 supporters of vehicle-for-hire apps Uber and Lyft were sporting black and pink T-shirts, respectively. One carried a sign that read “DON’T BE A GOOBER, VOTE 4 UBER.” Another’s read “GO LYFT.” As the seats in the council chamber filled up, they held a rally outside. The competing groups were on hand as the council considered a temporary ordinance to allow firms like Uber and Lyft to operate in the city legally. The two companies launched their services in Austin in May, even though neither was technically permitted under city law. Both Uber and Lyft connect people with freelance taxi drivers via a mobile app. The drivers use their personal vehicles. Payments are made entirely through the app. As in dozens of other cities around the world, the entrance of vehicle-for-hire apps into the Austin market has sparked tension with traditional taxi companies, which have long operated under local regulations that the newcomers have ignored. Over the next year, at least half a dozen other Texas cities are likely to tackle the same thorny debate. Houston in August became the first city in Texas to approve an ordinance authorizing firms like Uber and Lyft. But vehicle-for-hire app drivers are continuing to operate in a legal gray zone in Arlington, Amarillo, College Station, Corpus Christi, Dallas, El Paso, Fort Worth, Lubbock, San Antonio and Waco. Uber is also advertising for drivers in Laredo, Midland, McAllen and Tyler. The meeting stretched well past midnight before council members voted 6-1 to give initial backing to a temporary ordinance. On Thursday, the council will consider granting final approval of the new ordinance, though even councilmembers who backed it last week did not rule out proposing more changes. Austin cab companies and drivers argued that officials were instituting a double standard by requiring only traditional cab firms to continue to follow a host of city regulations, including a cap on taxi permits and strict fare guidelines. “If this is the direction we are headed down, why are we handcuffing one industry and un-handcuffing another industry to do whatever they want?” Councilman Mike Martinez asked during the council debate. He ultimately voted for the ordinance. The debate in Austin has been messy and complicated, with city officials hoping to welcome new, popular services while weighing concerns of how such a decision could impact the city in the long term. In the meantime, dozens of drivers working for either Uber or Lyft have been ticketed for working as illegal taxi drivers. Uber and Lyft are widely viewed as more nimble and reliable than traditional taxis. But some traditional cab supporters argued that Austin officials would regret welcoming vehicle-for-hire apps if the services drive traditional taxis out of business. How would Austin residents without smartphones request a taxi? What about those who don’t have a credit card? Local critics of traditional taxis recounted stories of waiting an hour for a taxi that never showed. They also argued that the lack of reliable service from traditional cabs contributed to more residents and tourists driving while under the influence in the city. “That economy is at risk if visitors and residents cannot find safe, dependable transportation back to their homes or hotels, particularly if they choose to drive impaired because those options are not available,” Jennifer Houlihan of Austin Music People, which advocates for the live music industry, told the council. Some vehicle-for-hire app drivers at the hearing, none of whom publicly addressed the council, said driving for Uber and Lyft had provided a simple yet powerful method of supplementing their income. Traditional cab drivers expressed fears that those part-time drivers were picking up the most profitable times to work and would ultimately eat away at their livelihoods. Other issues that drew extensive debate among the council were the fares vehicle-for-hire apps charge, the kind of insurance their drivers must hold and the way they conduct background checks on their drivers. Austin, like many other cities, regulates the fares that traditional cabs can charge. Uber and Lyft determine their own fares and can change them based on demand, a practice called surge pricing that the companies argue enables them to draw more of their drivers during periods of high demand. Uber and Lyft supporters argued that this creates a level of reliability that traditional taxi companies can’t match. Councilmembers considered proposals to cap the amount at which vehicle-for-hire apps could “surge” their fares but ultimately voted them down. Traditional cab drivers argued that they would have trouble competing for drivers and customers if their fares remained tightly regulated. “How could it possibly be equitable to allow one group of service providers price flexibility and completely restrict flexibility for another group of service providers?” asked Ed Kargbo, president of Yellow Cab Austin. One of the trickiest issues facing cities trying to find a middle ground between traditional taxi companies and vehicle-for-hire apps is disabled residents. Many cities require traditional cab companies to include wheelchair-accessible vehicles in their fleets. In its new ordinance, Houston requires vehicle-for-hire app firms to have 3 percent of their fleets be wheelchair accessible by next August. The Austin ordinance would apply a 10-cent surcharge to rides originating in the city to help fund wheelchair-accessible rides. Kemi Yemi-ese, who uses a wheelchair, told council members about how often she relied on yellow cabs for getting around. She urged that the council to amend the proposed ordinance to put Uber and Lyft under the same accessibility requirements as traditional taxi companies. Yet Elizabeth Garcia, who has a blood clotting disorder that makes it difficult to walk or stand for long periods, described the advent of Lyft in Austin as dramatically improving her quality of life, saying the service was more prompt and reliable than traditional cab services. “Please do not regulate such a valuable service I have come to rely upon out of existence,” Garcia told the council. Regardless of the outcome, the debate will continue throughout Austin and other Texas cities. Riley argued that by moving forward on a temporary basis, cities like Austin can get the data they need to implement a more lasting update of their taxi regulations. “One benefit of moving forward with this resolution now is we could see how it would actually work if the services were legal,” Riley said. Disclosure: Uber is a corporate sponsor of The Texas Tribune. A complete list of Tribune donors and sponsors can be viewed here.